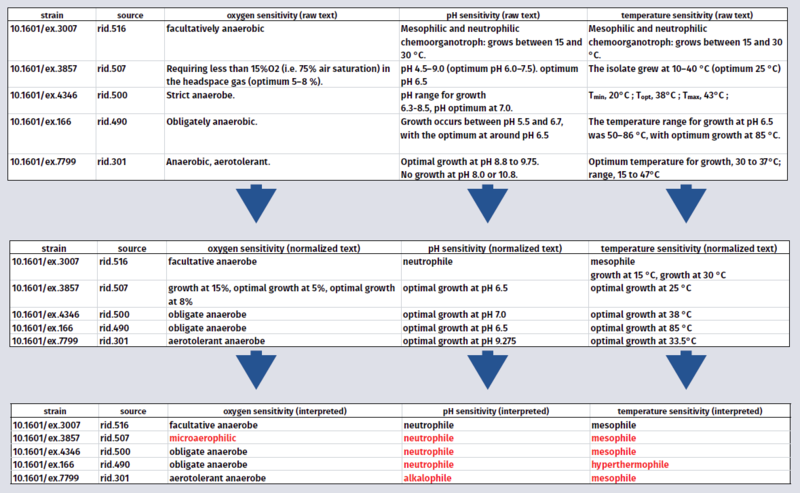 Using our curated taxonomy, prokaryotic type strain database, our corpus of taxonomic literature and our phenotypic thesaurus, we applied a novel software method to normalizing raw text into ontology-based phenotypic assertions. A reasoner to infers phenotype based on all available information available about a strain. Our method is able to use knowledge at appropriate levels of abstraction to correctly answer queries and produce new knowledge. Charles Parker will be presenting a poster at the GSC Workshop on May 5th. Despite significant improvements in genome annotation, many assertions are hypothetical and may lack experimental support. The taxonomic literature for prokaryotes contains a wealth of experimental phenotypic data, but that knowledge is currently in a form that does not lend itself to integration with databases or ontologies. Our knowledge base is designed to address these problems by providing reference phenotypic data for nearly all type strains of Bacteria and Archaea, based on concepts and observational data drawn from the primary taxonomic literature (the corpus of literature that supports our up-to-date taxonomy and strain database). We developed software (Semantic Desktop) to extract putative feature domain vocabularies from this corpus, we have since developed this vocabulary into a precise thesaurus of phenotypic terms, which will ultimately conform to W3C SKOS-XL semantics, providing a link between the language of microbial phenotype, the semantic web and existing NamesforLife services. [permalink] Posted May 1, 2015.